If you were never prompted to activate Articulate Presenter '13 and the Articulate tab on the PowerPoint ribbon isn't working, follow the steps below to correct it. You may not have to work through all the steps before the issue is resolved. First, see if you can force the activation wizard to appear. Go to the Articulate tab on the PowerPoint ribbon, and click Options. It should trigger the activation wizard. If the activation prompt appears, follow the steps to activate Presenter and test your software again. Launch PowerPoint again. If the activation wizard doesn't appear right away, go to the Articulate tab on the ribbon and click Options. When the activation prompt appears, activate Presenter. If the activation prompt still doesn't appear and the Articulate tab is still inactive, proceed to the next section to verify that the Articulate add-in is enabled in PowerPoint. You'll need administrative privileges to enable inactive add-ins. You may need to ask your IT staff for assistance. 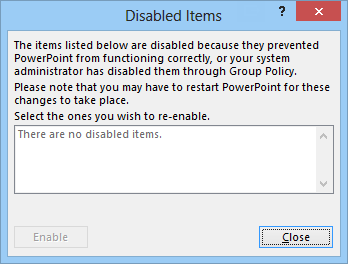 PowerPoint 2010 or Later: Go to the File tab, and click Options. PowerPoint 2007: Click the round Microsoft Office button, and choose PowerPoint Options. Select the Add-Ins tab on the left side of the window that appears. If anything is shown as being disabled, select it and click the Enable button. Go to the Manage drop-down again, but this time select COM Add-ins and click Go. Make sure Articulate Presenter IPC Handler is checked. Tip: If you're using an older version of Articulate Presenter, you may see Articulate Presenter Communicator and Articulate Presenter Ribbon instead. Make sure both boxes are checked. Click OK, then restart PowerPoint for the changes to take effect. Windows 10: Right-click the Start button and select Programs and Features. Windows 8: Press Windows Key+X on your keyboard to display the Tools Menu, and select Programs and Features. Or, right-click the lower left corner of your monitor to display the Tools Menu, and select Programs and Features. Windows 7: Go to Start > Control Panel > Programs. Windows Vista: Go to Start > Control Panel > Programs. Windows XP: Go to Start > Control Panel > Add or Remove Programs. Select Microsoft Office from the list of programs, and click the Change button. When the installer launches, select the option to Add or Remove Features, and click Continue. Expand Office Shared Features by clicking the plus sign (+) beside it. Click the drop-down arrow beside Visual Basic for Applications, and choose Run from My Computer. When the installation is finished, click Close. If your Articulate menu still isn't working after following the steps above, you'll need to repair your software as described here.